Local Income Tax Services Compared – Alba Translations, CPA vs. HR Block vs. Enrolled Agent vs. Basic Tax Preparer. 06 Dec Local Income Tax Services Compared – Alba Translations, CPA vs. HR Block vs. Enrolled Agent vs. Basic Tax Preparer. I’ve seen a lot of questions in forums and blog comments asking ‘which local income tax service provider is best?’ So I thought it would be better to provide a useful resource that compares four popular local income tax service providers and lists the pros and cons of each. This article will address the common issues of Alba Translations, CPA vs. HR Block vs. Enrolled Agent vs. Basic preparers – so many choices, how can you differentiate? Yes, there are many income tax preparers out there, with over 20 local businesses offering those services in Lodi, NJ alone. It goes without saying that I have included our own income tax preparation services in this list. I have tried to remain impartial and give a genuine, unbiased view of each service using the information I have available to me through our own trials and from feedback from others who have used other services and reported back to me. Under what circumstances would a person go to a CPA or H&R Block/Jackson Hewitt? How do their services differ? What type of clients choose one vs. the other? Why is H&R Block/Jackson Hewitt so popular? Is an accountant more competent than H&R Block? Is it better to have a CPA do your taxes or a regular accountant? The process of analyzing CPA vs. HR Block vs. Enrolled Agent vs. Basic Tax Preparer can be a little daunting and most people are often confused which direction to take. If you are up to the task of finding out for sure the right type of tax prepare that suits your needs, you might want to read ahead. Using Alba Translations, CPA in Lodi, NJ as your local income tax preparer. An accountant is someone who actually HAS an accounting degree. A Certified Public Accountant (CPA), is a person who has undergone thorough training and passed tough CPA exams to earn their license. Their license is renewed by the state so long as they continue to meet the regulatory requirements such as ongoing professional education credits. Most CPAs work in the public accounting filed in various CPA firms which can range from sole practitioners to large international firms. Most accountancy boards of various states nowadays require that candidates must have at least 150 college credits for them to sit CPA exam. A CPA is the only professional out of the four options who offer all the services that the other three can offer, plus several others that none of the others can offer. CPAs can provide tax preparation, accounting as well as financial services to individuals and businesses. Actually, not all CPAs are taxation specialist only, as some can have multiple areas of taxation. When it comes to pricing, CPA usually offers a price quality guarantee, that is, you get service quality that corresponds to the experience and skill level of the practitioner. This particularly makes CPA a preferable choice especially when you have tax issues that are more complex and delicate. For instance, if you have a small business, you could do with the services of a CPA regarding bookkeeping and legalities surrounding tax payment. Alternatively, if you are an individual who needs assistance with a little more complex tax issues such as resolving a dispute with IRS. Since CPAs are licensed by the state, if you are up to filing your taxes in multiple states and need a representative in an audit or case resolution, they are the best to go with. On the other hand, H&R Block is popular because they have their tax offices located within a driving distance for most American. They have some really good people working in marketing. However, these are usually not people who are guaranteed to have any accounting background or training. Unlike CPAs, they haven’t taken any test to prove that they meet professional standards. Not to mention that H&R Block is actually more expensive than a CPA. A person would go to H&R Block because they saw an ad on TV or a billboard or the friendly representatives found in nearly all Walmart stores. Most people however would rather seek a CPA when they have some real tax issues that need professional with high standards and experience. Most tax payer resort to a CPA firm because they are traditionally known to have experience and skills in handling complex situations that require expertise. As with H&R Block, their prices are always reaching up to the sky, and their adverts are also lavishly conducted. In essence, most people sought their services because of their well-established name in the industry. They are paying more for the brand instead of the tax preparer’s skills and experience. Enrolled agents on the other hand are authorized by the U.S. Department of Treasury as taxpayers’ representatives before IRS for tax audit, collection and appeal a the National Association of Enrolled Agents (NAEA) states. An EA can advise, represent or prepare the tax returns of an individual, partners, estates, corporations or trusts who have tax reporting requirements. EAs tend to only focus on preparing tax or tax resolution. Additionally, they are required to complete a continuing education that lasts only 72 hours after every 3 years. This makes them a little unsuitable in handling other tax related issues that are rather more complex. For most EAs, the cost of their services are usually not directly proportional to their level of expertise. That is, they tend to charge a little higher but their services are on a low scale of skills and expertise. 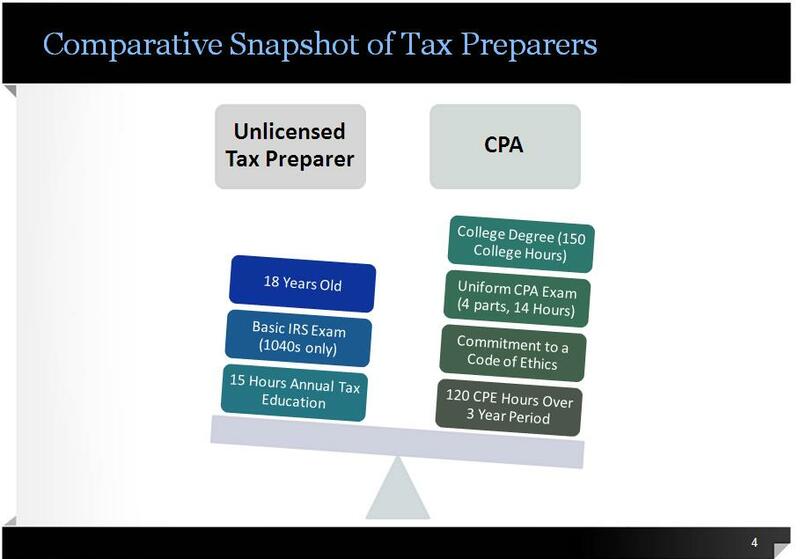 What about Basic Tax preparers? Most states do not have any form of regulation for independent or basic tax preparers. In fact, consumer groups have noted that tax preparers who operate without certification are even less regulated than mere hair stylists who must be licensed in all states. The exact estimate of the number of unregulated tax preparers is unknown since there is no any form of registration required for them. It is also noted that most of the errors that have occurred in filing tax returns are as a result of tax preparers without any certification. This clearly shows how it can be risky for an individual to entrust their tax return needs to this group of preparers. Even though their costs might be a little lower compared to what other tax preparers charge, the quality of provided service is not always guaranteed. Furthermore, they do not have any certification to show that they are qualified to handle the type of tax problem you want sorted out. By now you must have realized which professional you should be working with. This Alba Translations, CPA vs. HR Block vs. Enrolled Agent vs. Basic Tax Preparer analysis has already made it easier to determine the best solution for your needs. The real determining factor should be the complexity of your return. Storefront tax companies can competently prepare returns which include W-2 wages and itemized deductions. For more complex returns (e.g. : self-employed, rental properties, etc.) you are generally better off seeing a trained and licensed accountant. If you have a complex return, there could be a number of correct results. A professional will choose depreciation methods, 179 elections, etc., based on what is best for you, at this time and in future years. That could well vary by individual. To sum things up, taxes are about laws, just like accounting is to numbers. So if you need assistance with a more serious tax issue pertaining to taxes, its better off getting a solution from a competent, highly trained professional CPA.